No, not really. Then again, it's not quite Kerry Blue either. I have begun knitting a baby blanket for a baby whose entrance to the world is set for January. 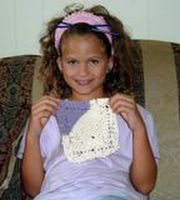 I am using the pattern for Kerry Blue from Traditional Knitted Lace Shawls by Martha Waterman as a guide for the gift. I have considered knitting this pattern as a shawl before, but I think I'd do some charting first. I think I'll be doing some charting for this blanket, too. I chose this as the inspiration for this baby blanket for "blue" in the title (supposed to be a boy), and the reference to Mobile, AL in the description of the shawl (mommy-to-be's family lives near there). So, I am off on a new knitting adventure, working from the center and working my way out on this cuddly gift. I'm pleased to see improvements in my knitting and finishing techniques. I finished the hood for my Kangaroo, and I must say that I'm easily a bit impressed with the way I sewed the seam on that. Now I just have the sleeves and the rest of the seaming. Oh, yeah, and the elastic cording. Hmmm...I've still got to buy that stuff. Oh, poor, pitiable, me! I must go shopping. And speaking of shopping, if I am accepted for participation in Secret Pal 6, I will get to shop for and spoil someone else. How very exciting! Okay, so two doesn't really qualify me for living in the land of FO central, but I'm thrilled with my progress. I completed Soleil and Mary Ann's Cashmere & Pearls Lace Scarf. I had the opportunity to show off the scarf at yesterday's knitting meeting (if I had shaved my armpits I could have shown off Soleil, too). I was pleased by the oohs and ahs over my work and confirmation that I had chosen well for my beads on the project. What made me even more happy, though was to see so many of my knitting buddies, some of whom I hadn't seen in awhile. We really do have a great group of knitters. I have been thrown by a new dynamic in the group, but I've determined that what has been most difficult for me is recognizing that what irritates me about this new element mirrors a deficiency in my personal skills. Have you ever noticed that sometimes a person whom you find a bit annoying has a character flaw which you are reluctant to admit you also share? When I make this realization, whew, it's like holding that lighted 10X magnified mirror up to myself. It's scary, ugly, humbling, and a bit embarrassing. It just goes to show that there is always room for improvement in life. Back on the FO topic, I have progress to report on my Kangaroo Duo from The Purl Stitch. I have completed the front. I had already finished the back, but the front was left at the 2/3 mark for months. It languished in a pile while the mercury snaked it's way up the thermometer. It isn't any cooler here, in fact it's even hotter now than when I unceremoniously stuffed it away for later, whenever that might be. However, I found myself in need of some mindless stockinette, so I pulled it out of hiding, and lo and behold, I might wear this when the weather finally does turn off cooler. Speaking of weather conditions, I hear the thunder rumbling in the distance (not far off enough), so I must get off the computer. In a weekend filled with teething and tears, fevers and frustration, knitting prevailed. Okay, so I'm being a bit silly, but knitting really did come through over the past few days. I was helping watch the neices and nephews at my mother's house, and it was a bit chaotic. The baby was sick, the weather was not conducive to getting outside to play, so we got out the needles and did some knitting. I had taught the twins a bit of knitting before, but this was the first time either one stuck with it long enough to complete a "project," as they like to call it. Austin says he doesn't want to learn to knit, he just wants to make a "project." Well, his washcloth is coming along nicely, but he was able to entertain himself with the blocks and didn't spend as much time knitting as Autumn did. Now, I knit in the continental style, but everyone I have taught to knit chooses the English/American style. However, this weekend, Autumn wanted to know more about the way I knit, so she is doing a bit of continental now, too. That makes me feel a bit more confident in my teaching abilities. She took to that k2tog quite nicely, too. So, at the end of the weekend, Autumn was able to show off and carry home her washcloth. Now, my knitting did not progress as much as I would have hoped, but all said, this was a good knitting weekend.